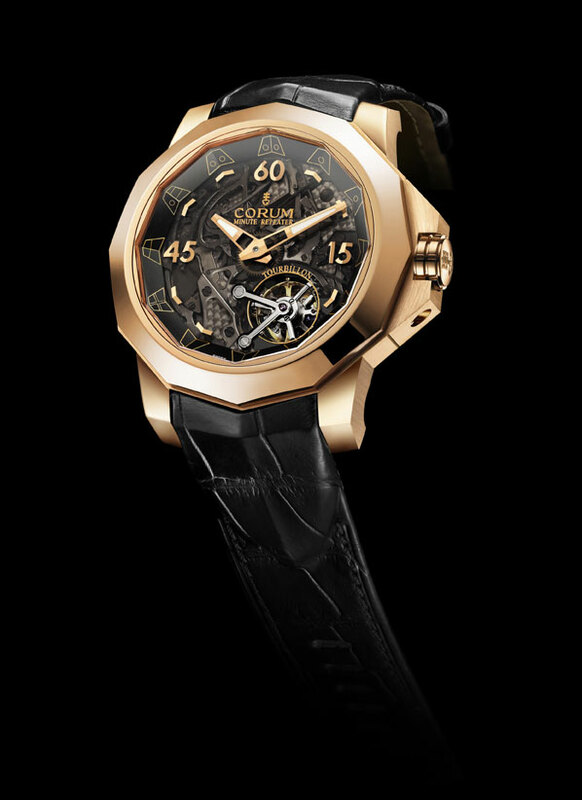 To celebrate Admiral Cup’s fiftieth anniversary, Corum has chosen to associate to this eminently sporty watch with two of the most prestigious horological complications: the Tourbillon and the minute repeater. The use of a minute repeater in a watch with marine connotation is not a common feature, however this complication concentrates the strength of two universes, as life on a boat is governed by night and day with ringing bells. From ‘action stations’ in the morning to the evening ring, and even during attention to colours, it is a sailor’s life that is punctuated by these ringing tones. The model sports the CO 010 caliber. The development and adjustment of this exceptional movement took two entire years for which Corum required the participation of a dozen of its best watch-making craftsmen. Each of the components were conceived and developed to guarantee the precision and beauty of the tone by considering its ‘power’ (expressed in decibels), its ‘precision’ (note correctness), its richness (expressed in number of partials) and its ‘reverberation’ (duration of each note). The minutes-rack, placed at the heart of the ringing mechanism, is inverted compared to traditional minute repeaters in order to bring strength and precision to each note. It has also been enlarged to permit a wider lift angle to each tooth, extending the time between notes. The racks hitting the gongs are made out of ultra resistant and hardened steel. Fixed to these racks, countersprings have been specially conceived to find the best balance of the hitting strength and speed. During the ringing, the rhythm is regulated through the rotation of an inertial flywheel, visible on the movement’s back. The gongs, made from an alloy featuring a composition and thermal treatment that are a closely guarded secret, have been adjusted to strike the hours on an A note and the minutes on a C sharp note. These two notes have not been chosen randomly, their specific sequence forms a major third (two tones) with a more cheerful harmony than a minor third (one and a half tones). The precision of the whole mechanism is guaranteed through a Tourbillon with Silicium escapement and pallets offering reliability and durability.